Just in love with Alyssa and Mitchell’s Lord of the Rings themed wedding at Loews Royal Pacific Resort at Universal Studios. The couple met and fell in love when they both moved to Orlando to work for the theme parks. 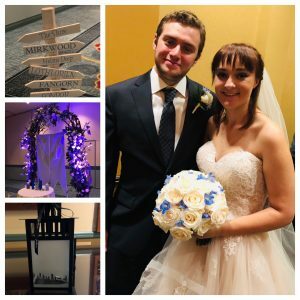 From the music they walked down the aisle to, to the banners of the elves and Gandor, and the lanterns with silhouette scenes from the movies, they took the best from the Lord of the Rings stories for their wedding decor. Regina Hyman Photography photographed the couple before the ceremony with a sword and a beautiful staff they used as props. Jessica with Just Marry coordinated the touching and creative ceremony. With amazing floral decor from Raining Roses; not to mention the beautiful bouquets and boutonnieres, it was a sight to see. Rev.Glynn Ferguson with the Orlando team of Sensational Ceremonies officiated the couple’s unique and touching wedding ceremony. From the welcome of the guests: “Welcome! Today you are here because you have been invited to join in an adventure. You will be witness as Mitchell & Alyssa embark on the adventure of marriage to one another. As Bilbo Baggins said to Frodo, “It’s a dangerous business, going out your door. You step onto the road, and if you don’t keep your feet, there’s no knowing where you might be swept off to.” Love is much the same, it’s dangerous to fall in love with someone, you never know where it may take you. For Mitchell & Alyssa, it has taken them through ups and downs, good times and bad. Mitchell & Alyssa thank you for the journeys you have taken today to be with them as the commit their lives to one another.” To their Tolkien themed ring exchange, “It is now time to exchange rings. Wedding rings are symbols of the journey taken together, a completion of one story and the start of another. Forged by the fires of compassion, compromise, and love, not to be easily destroyed. To alter from Tolkien: Two rings to rule them all, Two rings will find them, Two rings to bring them all and in this marriage, bind them.